Cupcakes 'n Daisies: What I saw . . . It feels great to be home after being at the AQS Quilt Show in Paducah, Ky from last Monday to Friday. A full week of nothing but quilty fun. I've decided to break down my week of fun posts into three categories, what I saw, what I learned, and what I bought. Today's post is what I saw. I saw so many beautiful quilts it would take a month to share them all so I narrowed it down to my favorite 10 quilts at the show, get ready to be inspired. 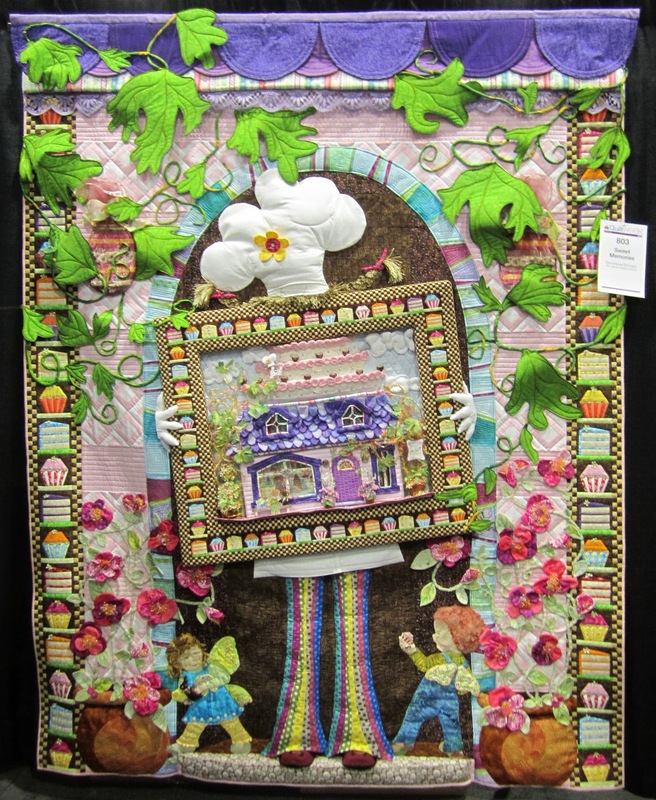 This is the Best of Show winner, Fiesta Mexico by Renae Haddadin and Karen Kay Buckley, from Sandy, Utah. This quilt is an original applique design by Karen, inspired by Mexican pottery. Renae did the quilting on a longarm machine. 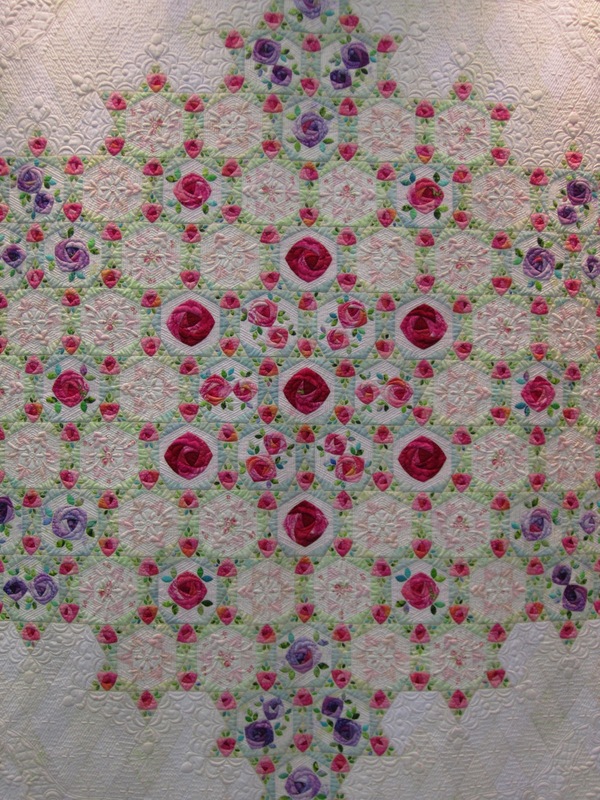 For more detailed pictures and information regarding this quilt, click here to go to Karen's blog, Karen Kay Buckley. 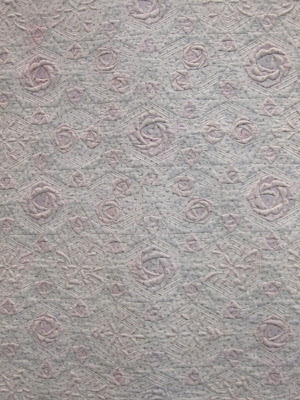 This quilt is the AQS Best Hand Workmanship winner, The Charm of Small Pink Roses. It was pieced and hand appliquéd by Keiko Minami from Kawanishi-shi, Japan. My pictures don't do any of these quilts justice, but particularly this rose quilt, it was amazing. My favorite aspect of this quilt, besides the fact that it is red and white, are those adorable little snails lining the border. This is Sweet Memories by Dominique Ehrmann from Quebec, Canada. This quilt is a personal design depicting Dominique's 25 years as a baker and chocolatier. 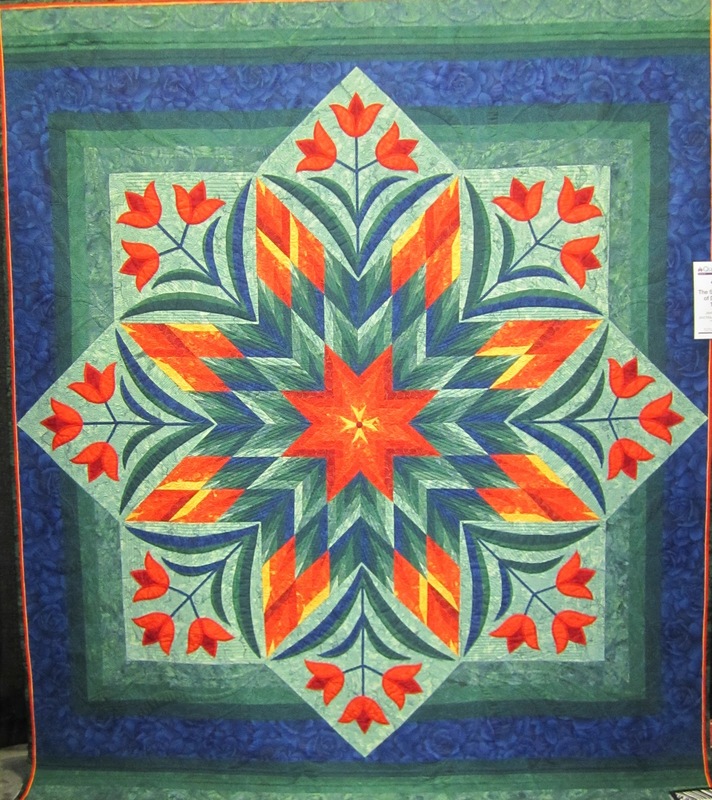 It's hard to tell from this picture, but this quilt is three dimensional, the leaves and center section of this quilt stand out from the background. This is Complex Irish Chain by Beth Nufer of Brookings, Oregon. The Irish Chain was designed on graph paper integrating the color wheel. 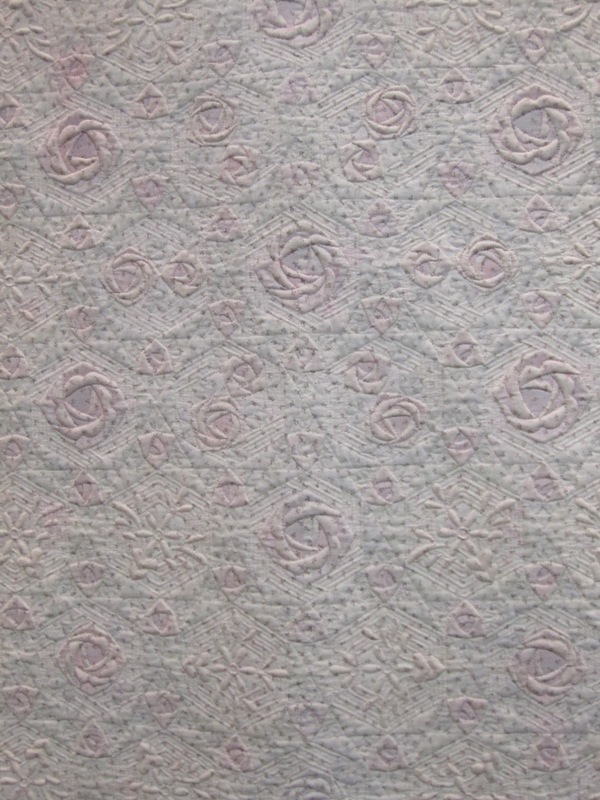 It was longarm quilted by Joann Hoffman. 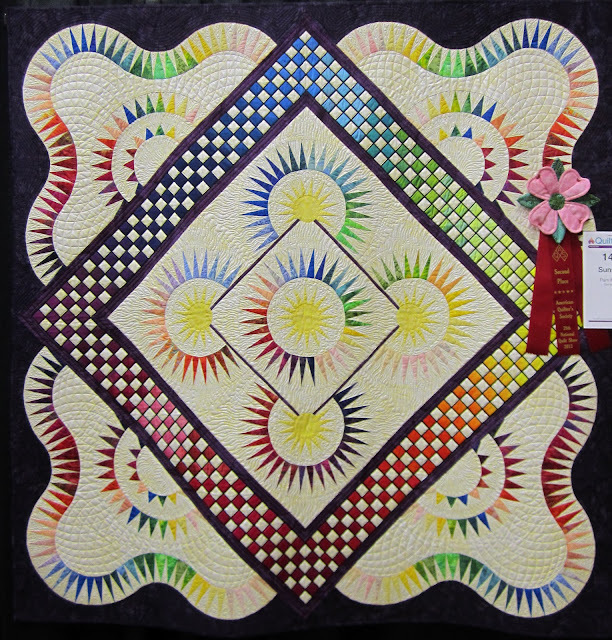 Here's a link to Beth's blog, Beth Nufer Award Winning Quilts, click here. This is Sunshine by Pam McIntyre, from Gainseville, Florida. 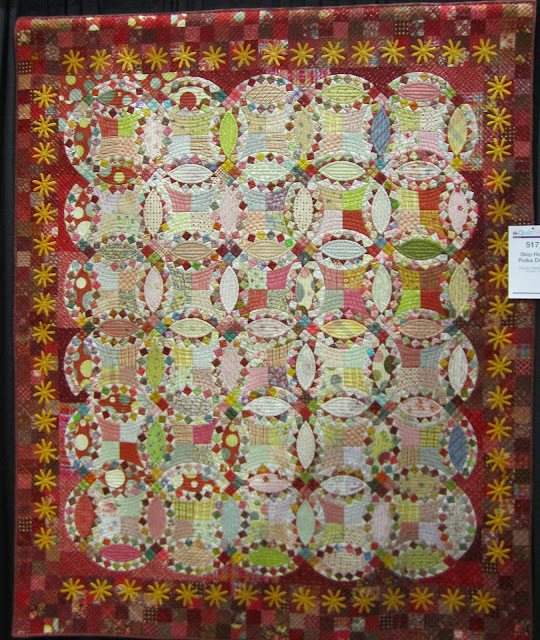 This may be my favorite quilt at the show, the combination of pattern, color and quilting are perfect. It came in second in the small wallhanging division. In addition to the quilts juried into the show, there were also quilts on display by book authors. This quilt was made by Sumiko Minei who authored the book Double Wedding Ring Quilts. Here's a nice closeup view. This is Skip Hop Polka Dots by Estuko Matsuda from Northville, MI. This hand quilted top was made for for Estuko's granddaughter, to inspire her to sing and dance. This is Tulip Fire by Susan Stewart of Pittsburg, Kansas. It won the Bernina of America Best MachineWorkmanship award. And finally, this is The Secret Life of Dancing Tulips by Jeanne Brenner and Maureen O-Doogan of Monticello, Florida. 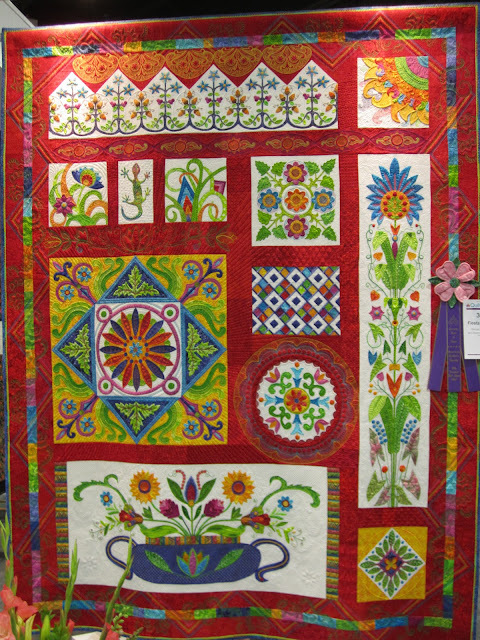 There were over 400 quilts on display at the show from 44 states and 8 other countries. I find that the quilts that I prefer at each year's show reflect the phase I'm currently going through as a quilters, right now that would be bright colors and flowers, did you notice? Next up, what I learned! Inspirational! Thanks for sharing these! Such beautiful quilts! Some of them have obviously got hundreds and hundreds of hours put into them. Thank you so much for sharing! You picked some beauties. I keep going back, though, to the red and white. Thanks for sharing. amazing quilts, I love looking at the quilting too. skip hop polka dots is just so fun did you take any close ups of that quilt????? Great post and I missed you last week! Thanks for the photos they are all beautiful. I am surprised you were able to get such great pictures with all the people there. When I went I had trouble just getting close enough to look at the quilts. You're back! Love the pics. It must have been such fun. Have you been to that show before? I think I remember you going in the past. How does this one compare to other shows? This is a big one but I have a problem visualizing a bigger show than the International Quilt Festival in Houston. That show is dizzying. I'm going to the Vermont festival in June this year. They are having a special exhibit on the Dear Jane quilts and I really hope it's worth the trip, but my sister and I have been throwing around ideas to visit a big show. She mentioned Paducah, so I thought I'd ask your take on it. Thank you for sharing these wonderful quilts. I am in awe. I too love the tulip quilts. tulips have been my favourite flower forever. Thank you so much for the "quilt show"! Your descriptions and other information is much appreciated. Can't wait to see your next posts! I'm so glad you had fun! My favorite is the red/white quilt. I love it because it's all over the place --redwork, applique, piecing, etc. Truly a sampler. Thank you for sharing these AMAZING quilts ! Glad to here you had fun ! Your photos made a great quilt show for so many of us who weren't able to be there in person. Always inspirational. Thanks for sharing. What lovely quilts. I wouldn't mind if you showed us some more! In fact I would be delighted. Thanks for sharing, the quilts are great. block of one of these - think nothing of the whole quilt. Fantastic quilts! Thanks so much for sharing! WOW! What a feast for the eyes. Thank you for sharing! So much fun! So fun to see all the different types of quilts. Can't wait for the rest of this weeks posts! Gorgeous quilts and I love them all! I have been to Paducah but never to the quilt show. Next year it is on my to do list.